LAFARGE, a world leader in building materials, held a global supplier competition for the first time in its history. A total of seven categories were distinguished in a ceremony at the headquarters in Paris. With its ADAMS® technology for filling powder-type products into watertight PE (polyethylene) bags, HAVER & BOECKER was able to win in the category of ‘sustainability’. The jury’s reasoning: the technology showed “an ability to operate in a sustainable manner, including the deployment of appropriate corrective actions”. The now prize-winning HAVER ADAMS® technology for filling powder-type products into watertight PE bags was developed together by both companies in a mutual co-operation project. Lafarge Tarmac had identified a significant customer issue: the wastage of cement from damaged paper packed cement for which PE bags were an excellent solution. The combination of Lafarge Tarmac’s customer and solutions led focus with H&B’s technical expertise has resulted in PE bags being a very successful innovation in the UK packed cement market. Since 2005 HAVER & BOECKER OHG has equipped six Lafarge Tarmac plants in the UK with 12 HAVER ADAMS® filling systems. Lafarge Tarmac is a 50:50 joint venture between Lafarge SA and Anglo American plc. Over the past years the HAVER ADAMS® technology has been upgraded so that an increase in speed from 1,200 bags per hour to 2,000 bags per hour could be reached. Drop tests conducted at the HAVER & BOECKER Research and Development Centre have shown that PE bags are 500% more resistant to tearing than paper bags. The number of bags damaged by normal handling over the course of the entire logistics chain is well below one per cent while for paper bags the figure is 5% to 7%. Product loss after filling and during transport is thus prevented. Compared to paper bags, filling takes place with 50% better weight accuracy. All these characteristics result in reduced product use. Because the production of cement consumes resources and emits CO2, the use of PE bags can be viewed as a significant step in reducing environmental impact. The emptying of residue is considerably higher with PE bags. While up to 120 grams of product remain in a paper bag, the value for a PE bag is only 20 grams. This means product use is reduced, and this means CO2 savings. The manufacture of paper bags is energy intensive and requires large quantities of water, which in turn subsequently needs to be treated. PE bags also offer benefits when it comes to disposal: while paper bags are burned or thrown away, and thus burden the environment, PE bags are 100% recyclable. And in the event paper bags should be indeed recycled, the need for energy is ten times greater than what is required for PE bag recycling. In addition to the advantages of sustainability, the ADAMS technology is convincing in other areas. Because cement is a product that can put health at risk, trigger skin irritation, allergic reactions, or even lung ailments, inhaling it or contact with skin or eyes must be avoided. So that the surrounding areas can remain free of dust or product residue, the packaging needs to be air-tight. Using PE bags means the packaging is hermetically sealed. Neither the machine operators in the plant nor the workers involved in transport, stocking, or even the end-customer, become subjected to danger when handling the cement. The bags are absolutely air-tight and a contamination of the environment is excluded as long as the bags are not damaged. The PE bag’s impermeability results in extended shelf-life.This makes production more independent of temporal and seasonal fluctuations. The plant can be continuously operated at full capacity with the production flow having less variation. This creates a logistical advantage. Also because of the PE packaging’s impermeability, filled bags can even be stored outdoors without adversely impacting product quality. This kind of stocking is considerably less expensive than stocking in a warehouse. It is possible to stock and display the product outside directly next to complementary products such as paving stones, which acts to boost sales. Because of the impermeability and tear-resistance of PE bags, the downstream system components such as the discharge belt, palletiser, etc. are subjected to less contamination and thus less wear and tear. Cleaning costs and maintenance intensity along with the associated necessary downtime are reduced. As a world premiere, HAVER & BOECKER introduced the ROTO-PACKER® ADAMS® MINI at Powtech 2014 in Nuremberg. It is based on the proven ADAMS® technology and for the first time fills powder products into compact PE bags, reaching speeds of up to 600 bags/hour at steplessly selectable weights from 1kg to 10kg. The technology will be ready for the market by the end of the year. Meanwhile the experts at HAVER s Innovation Management are already concentrating on increasing the speed to 1,200 bags/hour. HAVER & BOECKER is a tradition-conscious, family-run, mid- sized company with headquarters in Oelde,Westphalia, Germany. Under the umbrella of HAVER & BOECKER OHG, one finds the Wire Weaving and Machinery Divisions. Together with over 50 subsidiary companies on all five continents, they make up the HAVER Group which has 2,870 employees and 150 representatives. In 2013 the HAVER Group posted a sales turnover of €470 million. The Wire Weaving Division produces woven wire mesh and processes it into engineered woven wire products. They are used for screening and filtration by the chemical, plastics, automotive, aviation, aerospace, electronics, foodstuffs and feed industries, as well as for architectural applications and analysis sieves. The Machinery Division specializes in packing and weighing technology. It develops, produces and markets systems and plants for filling and processing loose, bulk materials of every type. The product range includes packing and loading systems for powder-type and granulated materials, packing machines for filling food and animal feed, as well as filling stations and complete filling lines for liquid and pasty products. The product range is supplemented by screening machines, machines for washing, pelletizing plates, agitators, mixers, palletizing and loading systems, silos, ship loading and unloading equipment. Industry 4.0 is the fourth industrial revolution and is characterized by the networking of intelligent machines that exchange information on their own, activate actions, and control each other. The production processes are horizontally integrated, which means the various components of the value- adding chain interact with each other and ensure efficient and flexible work processes. In the networked filling system of HAVER & BOECKER, weighing and weight checking systems communicate with other machine components and control the filling process of cement. The weight checking scale immediately delivers feedback to the filling spout and thus ensures the prescribed weight range is adhered to. This guarantees minimal deviations from the precise target weight and results in money savings for customers. The documentation of the process provides extensive possibilities for analyses and allows further optimization. The machine control system regulates the filling operation of the bulk good at the packer where the filled product is weighed continuously. The weight checking scale continuously transmits the actual bag weight and precise-to-the-gram suggestions for achieving a precise correction of the filling amount. Weight optimization takes place without loss of time. The bag’s actual final-weight is recorded by the discharge conveyor’s weight checking scale only after the filled bag is discharged from the bag chair. A possible minimal product loss arising from the bag’s discharge cannot influence the measured actual value. At the same time the transfer of determining the actual filling weight over to the discharge line leads to an increase in filling performance because the process ends more quickly without weight checks. Incorrect weight bags are detected and diverted. Here the check-weigher communicates with the diverting unit. Because the remaining bags are within the prescribed range, the system fulfils the legal requirements. If the plant operator specifies a larger weight deviation, then the range can be adjusted accordingly. Also vertical integration of a productions system is an important aspect of Industry 4.0. Here the entire system interacts with other company hierarchal levels and thus influence can be made from outside the production. With the systems from HAVER & BOECKER, collected data may be transmitted to the HAVER DPS® data processing system, saved, and statistically evaluated. With data such as line number, weigher number, type number, type name, specified weight, actual weight, tare weight, under-weight and overweight limits, type changeovers, error messages, weigher status and text messages the following values are computed: mean weight, standard deviation, total weight, total bag count, number of good, under- weight and overweight bags, hourly bagging speed and information on batch start and batch stop time. As a result flexible reports such as machine reports, daily, weekly, monthly and annual reports, error reports and single weight reports may be generated. This documentation and analysis tool allows customers to further optimise machine settings and thus boost productivity. When processing customer complaints, it is possible to narrow them down to single sources because the goods in question can be traced back to a certain production date, batch number or machine operator. By using performance assessments as to individual filling spouts, the plant operator can specifically target maintenance work. Spouts with less performance can systematically undergo maintenance. Especially the evaluation of fault reports offers the possibility of identifying fault sources more frequently or regularly. An analysis of fault sources provides information on possible improvement potential for the filling process. Flexible intermediate bulk containers (FIBCs), also known as bulk bags, are highly valued for the storage and transportation of dry commodities ranging from coffee to cement, writes Greg Bedford,Technical Sales Engineer. Typically around one cubic metre in size, giving a nominal weight of approximately a tonne, they offer benefits to supplier and customer alike. For a supplier FIBCs are low cost, light, strong and easy to handle, features which act to reduce transportation costs. Ease of handling, relative to smaller sacks, is also an important benefit for customers, and in certain industries one-tonne bulk bags are also a more economic scale at which to purchase. Reducing manual handling by switching from 25kg manually manipulated sacks to the use of FIBCs, in combination with mechanized material transport, is an ongoing trend that has prompted a rise in FIBC use over the last five to ten years. Fitting FIBCs efficiently into the supply chain requires the right equipment at both the packaging and discharge end, as well as for intermediate handling. These requirements can vary considerably depending on the scale of production of the material being handled and on how it is being used, once emptied from the FIBC. For example, if product is made on a small scale it may be delivered to a central depot in 25kg or 50kg sacks. Such practice creates a requirement to efficiently fill bulk bags from smaller sacks, ahead of transport or delivery to the customer. In contrast, commodities such as cement may be shipped in FIBCs but bought and used in larger volumes. Here, efficient unloading into a tanker becomes the challenge. Guttridge specializes in all aspects of mechanical bulk materials handling. This expertise is usefully transferred and exploited to design and supply integrated solutions for FIBC use. A particular strength is bespoke discharge systems that couple bulk bag dischargers with mechanical conveyors tailored to an individual plant or process. These deliver efficient material transfer from the FIBC to the point of use and may incorporate integrated weighing systems, with load cells and weigh controllers to provide sophisticated batch control. There are also options for highly effective dust control. Favoured discharger/conveyor combinations include those that utilise tubular screw conveyors. These can be configured with multiple screws, or for horizontal discharge, or with integral agitators to aid discharge. The tubular design provides complete material containment which is critical for dusty and/or hazardous materials and help to maintain a clean and healthy work environment. Screw elevators for FIBC unloading include the Sieveflo which, as the name suggests, incorporates an integral sieve to catch any foreign objects before they enter the process. This machine can also be configured for emptying 25kg bags, boxes or drum offering substantial flexibility within the factory. The following examples illustrate the application of Guttridge technology. At a port, a requirement was identified to empty FIBCs filled with cement, a fine powder, into road tankers for delivery to the end user. FIBCs usually have an outlet spigot which is tied off for transportation. These ties are subsequently cut to allow the product to discharge. However in this case the FIBCs did not have an outlet and so the bottom of the bag needed to be cut to release the product. The equipment supplied included a discharger with integral bag splitter and screw conveyors to elevate the product from the FIBC to the top of the tanker. Loading bellows were specified to aid product containment during transfer. An integrated dust extraction system prevents any escape of cement dust while a level sensor detects when the tanker is full and stops the conveyor. The net result is safe, fully contained, efficient cement transfer at the portside. In a project that illustrates the opposite problem, filling FIBCs, the aim was to repack product from 50kg bags. 50kg bags are too heavy to be manually handled in UK factories and so the preference was to receive the product in FIBCs which could then be mechanically discharged. In this instance Guttridge designed and supplied a mobile system that could be wheeled directly up to the container holding the sacks. The operator could then offload the 50kg sacks on to the discharger systems, sliding them into position to feed a belt and bucket elevator. This machine lifts the product into the FIBC. This versatile system reduces manual handling safeguarding the health of the operator while at the same time maintaining efficient material transfer. Whether you are a port agent, commodity trader or cargo receiver — and regardless of your responsibility dictated by Incoterms [International Commercial Terms] or the level of involvement from a commercial perspective — the way a cargo is handled downstream plays a vital role in shaping the way you operate upstream within the shipping logistics chain. End users’ requirements will affect a number of variants including the volatility of freight rates specific to a market segment as well as capital investment requirements for equipment to handle commodities. There are a number of examples of where such requirements affect aspects such as the available infrastructure for delivery of key commodities to landlocked countries, traceability of a commodity for quality control or even the ability for a local farmer to carry a 50kg bag on the back of his moped to his smallholding. These examples are part of a longer list of logistics chain service components, which collectively have implications on the overall cost of the commodity delivered to the end user and the value added along the shipping supply chain. In essence, there are a number of value-added services along the supply chain continuum that are linked to the added value for the receiver and, as such, may play an important role in shaping decisions upstream. A prime example of this was introduced into the industry by Nectar Group in the 1970s allowing clients to save money on vessel chartering, on lost or damaged cargo and by giving them increased flexibility in choosing both load and discharge ports. The first mobile bagging system revolutionized the logistics chain opening up trade routes that were previously restricted to only handling pre-bagged cargoes. The system, which has been refined to what is seen in today’s Nectar CompacTM range, efficiently and accurately weighs bulk cargo and feeds it into bags at the exact desired weight ready to be stitched shut and loaded on waiting transport. Traditionally, the markets that benefit most from this revolutionary provision have been those with more developing economies; insufficient bulk handling equipment or space at ports, little or no railway connectivity for bulk product or a simple lack of infrastructure investment. Containerization of consumer goods has enabled a certain amount of conformity across the market with consistent and increasing demand — anywhere in the world, standard container handling equipment can be found meaning that Nectar’s containerized bagging systems can be shipped to where they are demanded easily and quickly. On the flip-side, bulk handling infrastructure has not developed at the same speed — partly due to the sporadic changes in demand for bulk commodities — famine, disease, war, economic turmoil, government subsidy programmes and climate change have all made bulk imports erratic and investment in the corresponding equipment can logically been deemed uneconomical. An example of a location that has benefited substantially from this ‘plug-and-play’ style system is Mogadishu in Somalia — a country which is emerging with challenges in infrastructure and the wider commercial economy. With sugar being one of the staple food products imported into the country, the challenges of moving large amounts of product and processing it into a form suitable for delivering to the local population is still not carried out without immense difficulty. Consequently, this means that the cost of every service component along the supply chain is prudently scrutinized to ensure that the difficulties do not correspond to poor value for money for the end users. The process of shipping the sugar in bulk with destination bagging reduces the overall costs through a number of varied reasons which are often not at first obvious. From the start of the process we can see the implications — the speed that a ship can be loaded and discharged at port will of course have a repercussion on the chartering costs. It is well known that bulk product can be loaded at much higher speeds than the equivalent pre-bagged product. Nectar provides a speed guarantee to ensure that deadlines are met and costs for keeping the vessel in port are kept to a minimum. The guarantee ensures that there is no extra cost to the client should the cargo handling operation not complete within the allocated timeframe. When loading a ship with bagged products, there is guaranteed to be a certain amount of split or broken bags which results in lost cargo. The same can be said for the discharge. The traders of the commodity normally factor in an average amount of loss in the price therefore increasing the cost of the commodity for the end user. With destination bagging, the cargo is loaded into new clean bags in a good condition. Pre-bagged cargo will have been put through bagging systems often at the mills or processing plants far upstream of the direct end users and this often results in a lack of quality controls due to their lack of accountability to the end consumer. The absence of an accurate bagging process in this scenario means that the bag weights may show significant fluctuations from the desired weight. With the destination bagging service that Nectar provides to the clients, who are often present in the markets they are selling into, a weight guarantee of a very small tolerance thus giving them peace of mind that they are not being undersold or provided with inaccurate volumes of the commodity. The result is a cheaper bag of sugar for the end user with savings achieved within a number of aspects of the logistics chain. In the example of Somalia, the versatility of Nectar equipment has ensured that the first bulk shipment of sugar in Somalia in many years was discharged and bagged successfully despite some challenging port conditions. The wealth of knowledge and experience within Nectar ensures that all projects, no matter how big or small, are undertaken with the same professionalism and efficiency giving added credibility to its motto — ‘Driven by Innovation, Performance Guaranteed’. Interjute B.V., based in Hulst in the Netherlands, was founded in 1958. As the name suggests, Interjute was initially dedicated to the trade in jute bags before an expanding demand for polypropylene 50kg bags and later FIBCs made the company the partner of choice for many customers in a variety of industries. The fertilizer sector has been, and remains, a significant part of the total business of Interjute, although the company remains responsive to the needs of many other industries (i.e. cement, minerals, animal feed, sugar, flour and food ingredients) and can meet just-in-time demand for bags with the help of a huge printing capacity, experienced workforce and substantial quantities of bags held in-store. Initially, the company supplied bags largely to service bagged exports of dry bulk commodities produced in Europe; today, changing market conditions have meant that Interjute has developed a worldwide network of competent and dedicated local representatives, through which the company supplies bags to all corners of the globe and complying with often challenging customs regulations and trade finance norms as required. FIBCs now form an increasingly important part of Interjute’s business; as with 50kg bags, these now tend to be filled close to final user rather than at/near production site so blenders/packagers associated with local markets are increasingly important outlets for the company’s packaging products. IMGS on site supervisors will be present for the duration of the project, gathering information and preparing daily reports. Dry bulk shipping companies rallied strongly at the end of last year which reflects the daily charter rate for vessels carrying cargoes such as iron ore, coal and grain, surged to its highest level in two years. But while dry bulk rates are under pressure at present, there are some indications to suggest that the market is in the process of staging a full recovery. A chronic oversupply of ships has been one of the reasons that the shipping industry has remained so depressed during the past few years. Hundreds of new ships were purchased with cheap credit in the run up to the financial crisis when the industry was booming, and this overhang has kept the market depressed. However, now it appears that these order books are starting to run dry. In particular, the tanker and bulk carrier fleet grew 4.3% during 2013, roughly in line with the growth of global trade. In comparison, during 2009, 2010, 2011, and 2012, the four years when global trade remained depressed, the fleet expanded 8.4%, 10.7%, 10.4%, and 7.3% respectively. The dry bulk market is starting to find its feet again, but as of yet the recovery is not fully under way. The volume of cargo being shipped around the world has returned to growth, and the number of new builds hitting the market has declined to a multiyear low. IMGS aims to keep its customers’ operations up and running, wherever they are in the world, throughout the lifetime of their ships or fleets. In the shipping world, speed and compliance are essential. 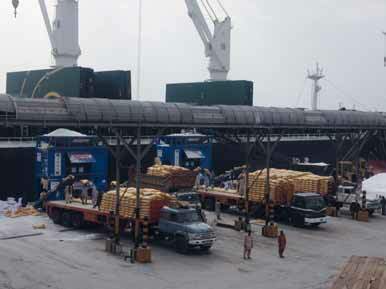 The speed with which a cargo is loaded, transported and discharged, will equate into the net profit of the operation.